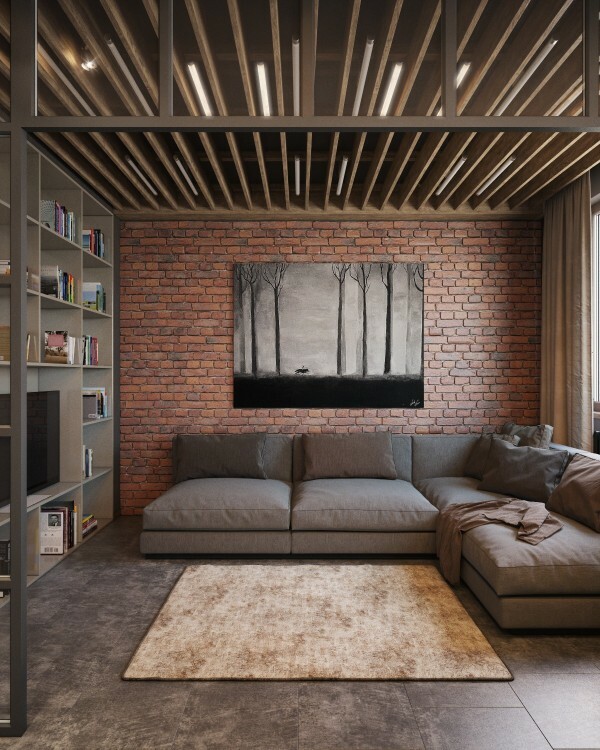 The look of exposed brick has always captured appeal. 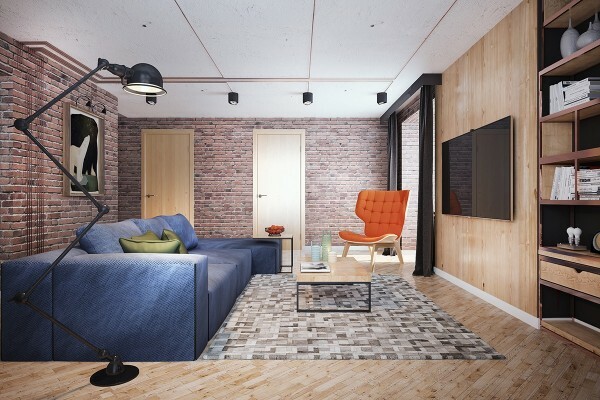 There's something so interesting about the texture and the subtleties of color in brick that it's no surprise to find it preserved in lofts, apartments, and other living spaces. 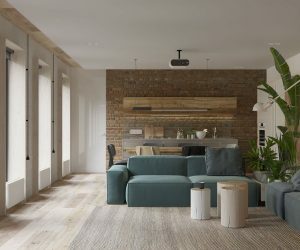 In this post, we'll explore two different uses of exposed brick in two very distinct living spaces. 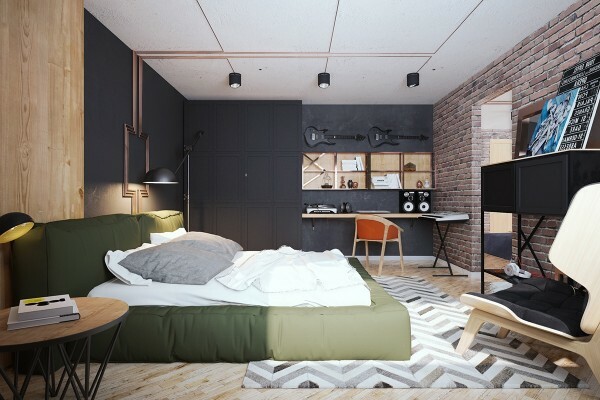 Whether it's playing center stage throughout a space or acting as an accent among other colors and textures, exposed brick is here to stay. 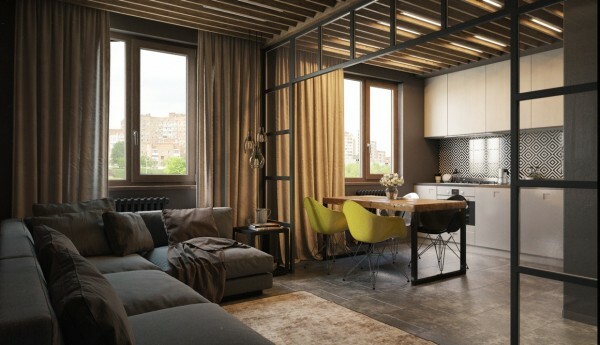 Measuring in at 65 square meters, this apartment may be small on footprint but large in style. 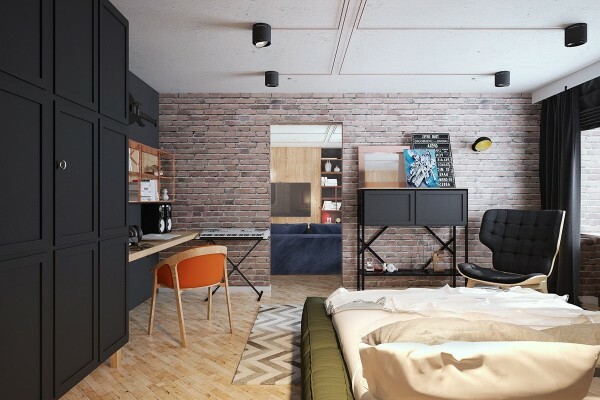 The design choices throughout are bold and here, unlike the previous showcased space, exposed brick is just one of many visual design choices that seem to work together perfectly. 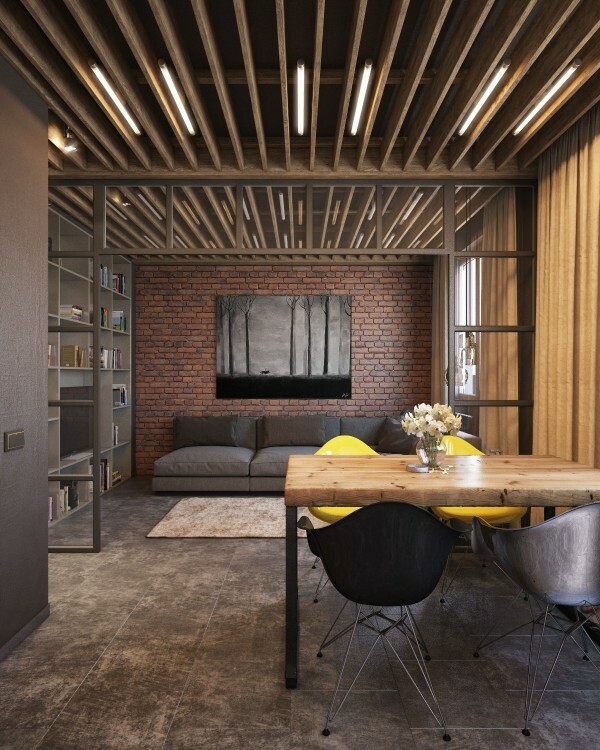 The ceiling is the star in this room, with exposed beams of wood blending together with tubes of light. 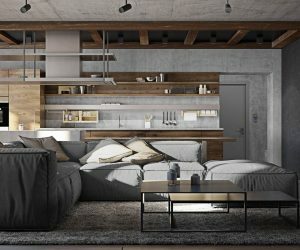 It creates an interesting visual while giving practical function to lighting the space. 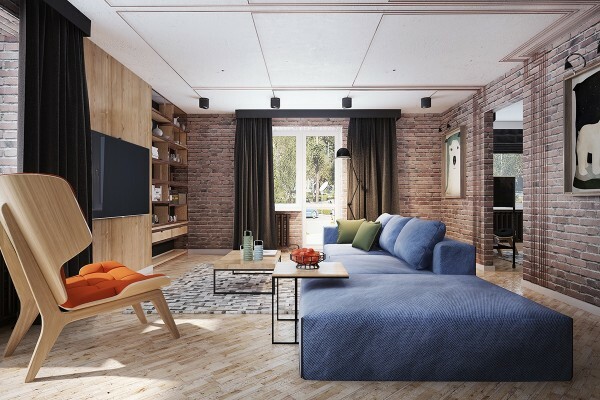 The play with texture can be seen here too with open shelving in a smooth media center, a textured floor of tile and carpet, and a contemporary couch set against the exposed brick. 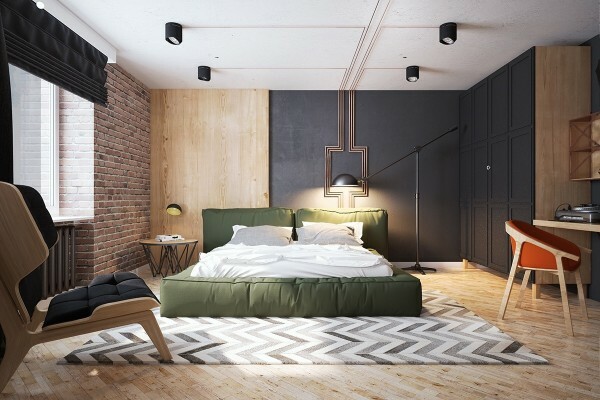 In the bedroom, parqueted wood flooring blends with painted brick, soft linens, and smooth surfaces to create a sleeping area that seems to transcend time with a bit of old and new. 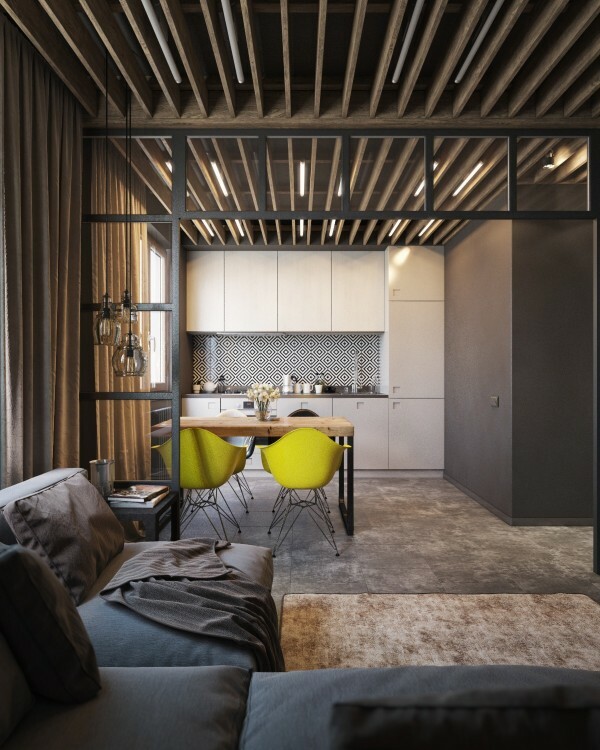 Pendant lighting, while not the focal point of the room, complements the rest of the space. The exposed beam ceiling of well-worn wood continues to play center stage. 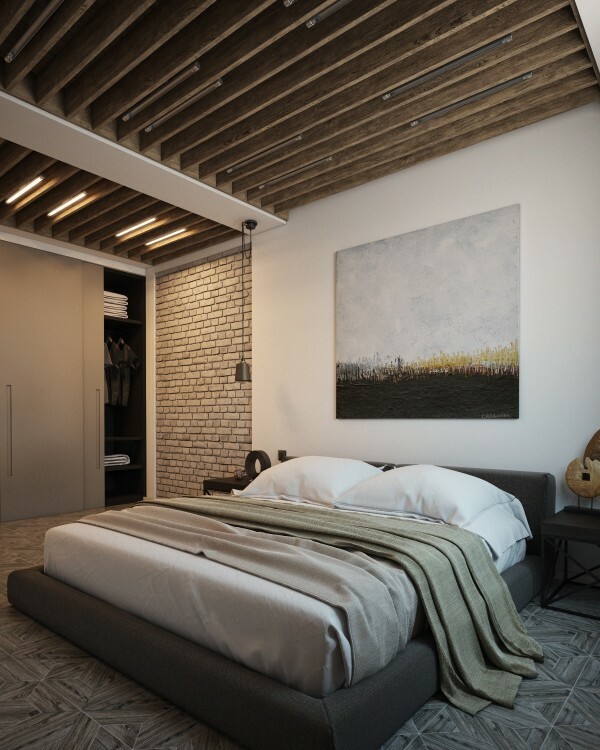 If you are specifically looking for exposed brick bedroom inspiration, do check out our post: 40 Bedrooms With Exposed Brick Walls. In the corner here, you can catch a glimpse of bold mosaic tile contrasted with the simplicity of the other elements of the entry way. Canary yellow dining chairs pop in the frame. 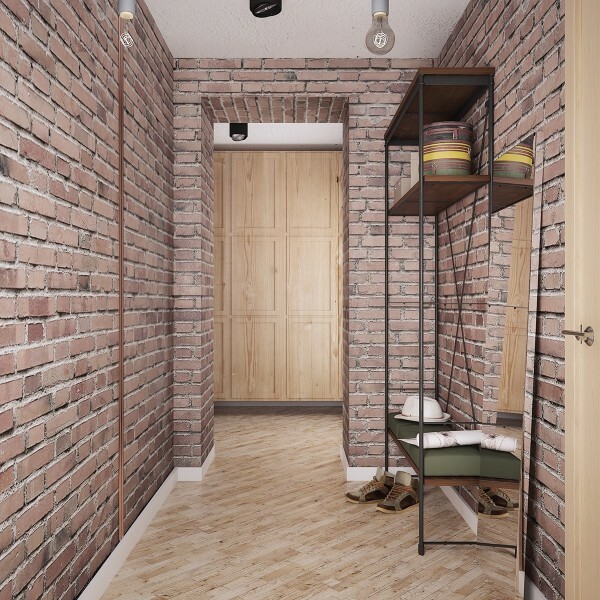 In this hallway, exposed brick makes another painted appearance as an accent, with the floor taking the lead visually. 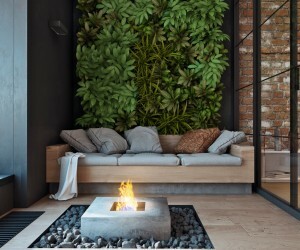 The smoothness and minimalism of the rest of the walls keep the space from feeling overwhelming and cramped. 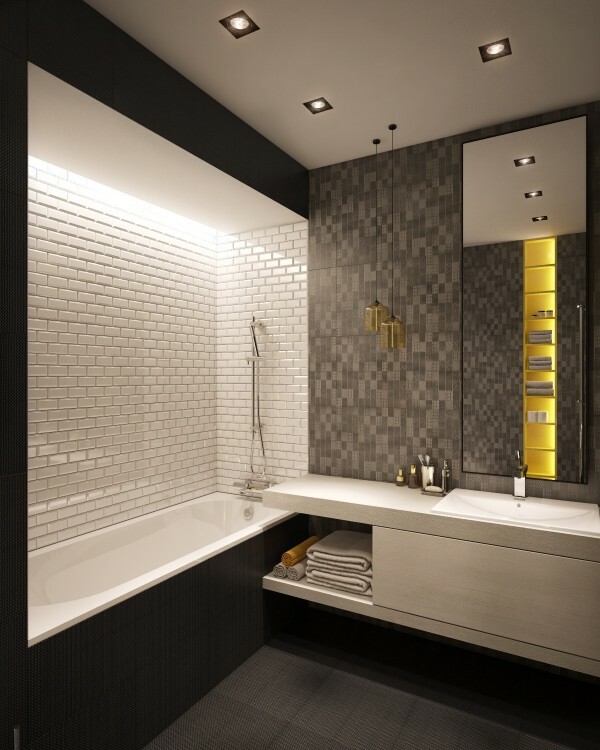 The white subway tile in the bathroom reflects the exposed brick in other parts of the space. 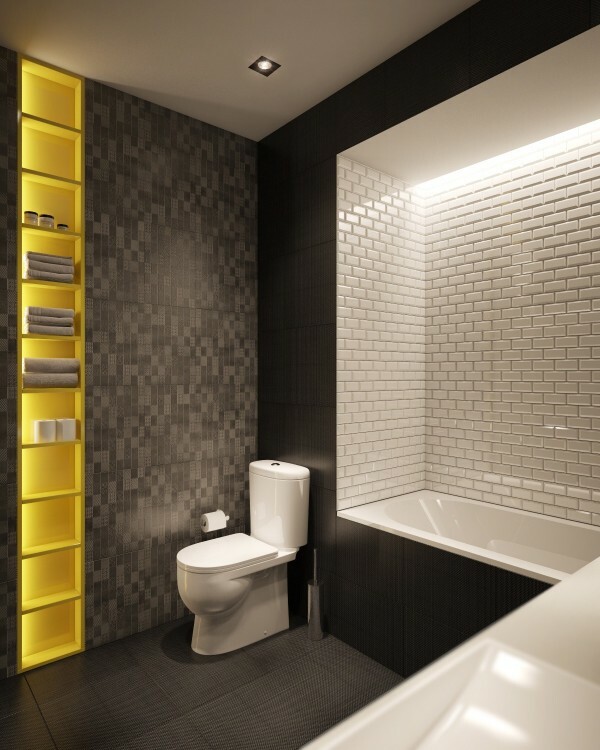 The pops of yellow, also found in other spaces, makes the bathroom feel lively and dynamic. Especially when you look at all of the textures used in the walls and floors. 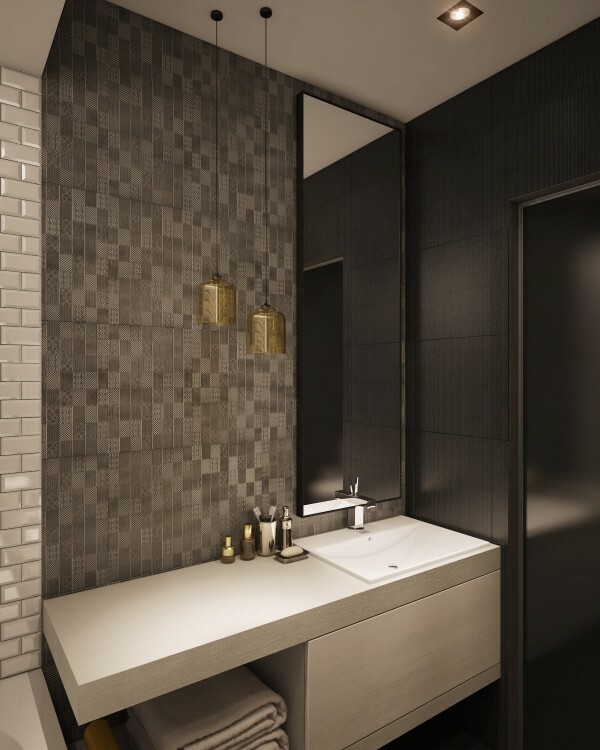 The modern fixtures are strikingly simple. 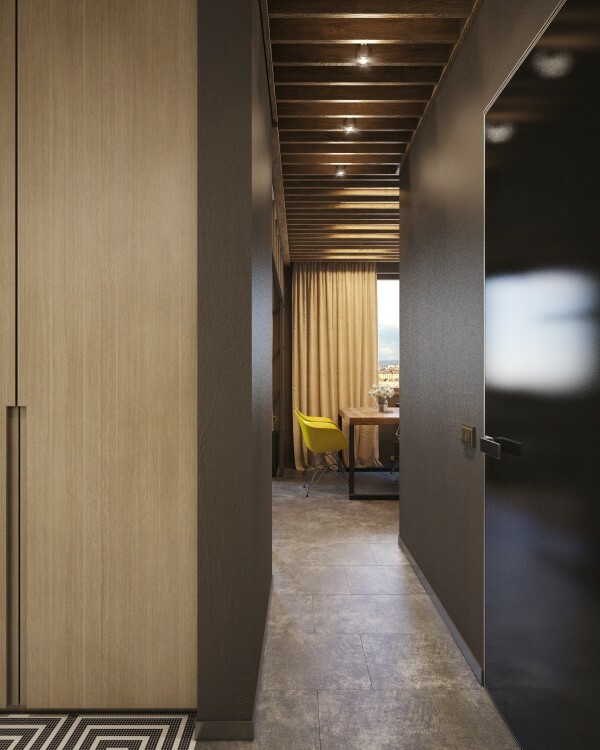 Back out into the main living area of the space, you’ll find additional use of texture and geometry, as evidenced in the open metal room divider. 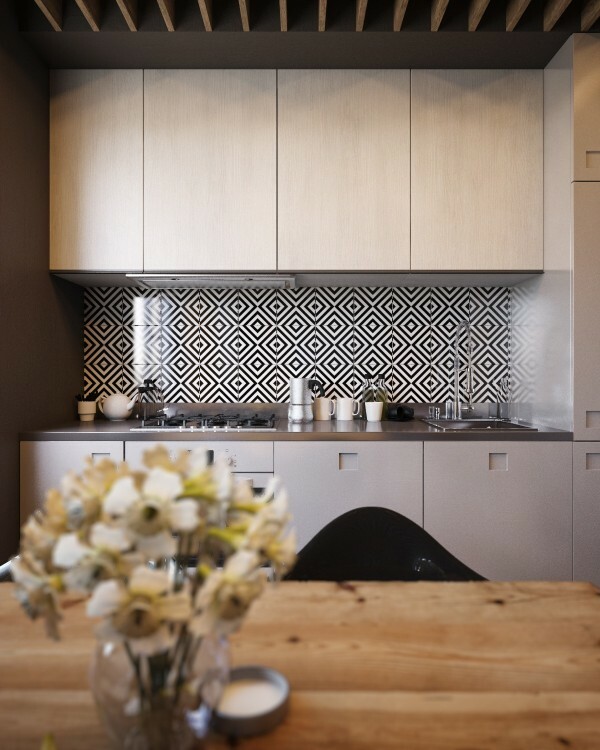 The tile backsplash in the kitchen is so interesting yet works well with the other colors and textures in the apartment. Somehow, it never feels like it’s clashing. Seen closer, it’s graphically interesting and is reminiscent of the same tile in the foyer. 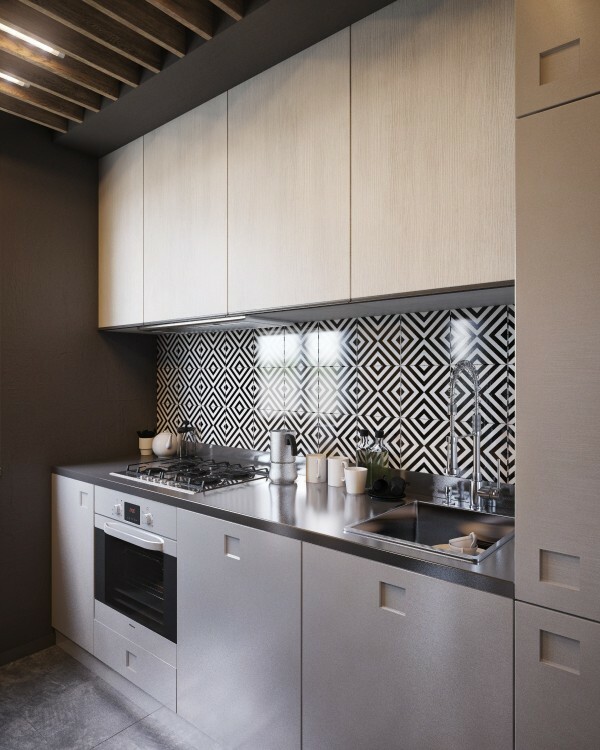 The appliances and storage are simple and modern, leaving the compact kitchen feeling uncluttered. And finally, out on the terrace with an open view, you’ll find shelving and a bright yellow chair along with bold tire work – all set against exposed brick. 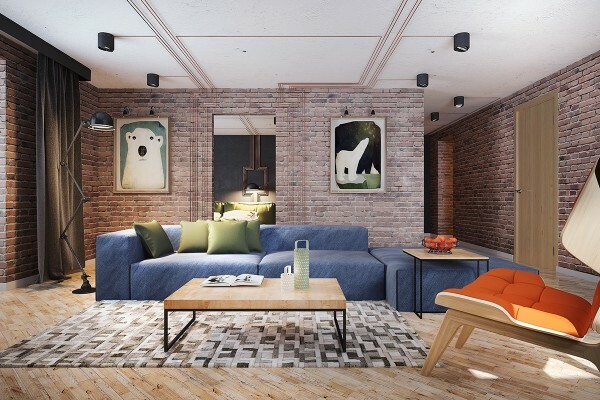 Exposed brick in this space as a whole has always been used as an accent, tying together all of the design elements while remaining playful with texture. 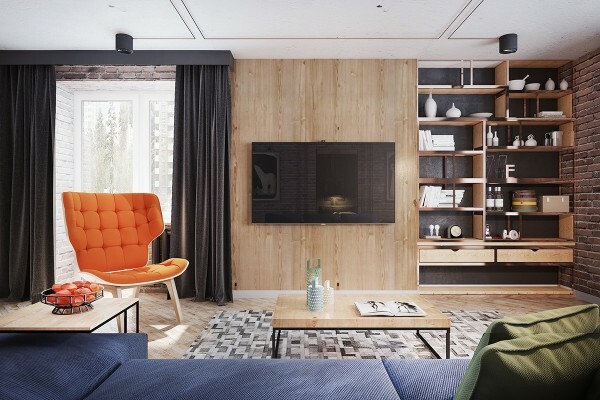 This space, designed by Juliya Butova, incorporates vibrant colors and playful images and patterns to create a space that feels so welcoming and cozy, even with its minimalist furnishings. 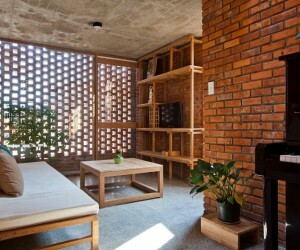 But, the exposed brick takes center stage. In the living room, a structural chair with bright orange upholstery gives the room an energy that’s offset by the soothing blues and muted hues of the exposed brick. And the polar bear paintings? Pure magic. Exposed brick is the chief wall choice throughout the entire space and the brickwork is mirrored in the choice of area rug. 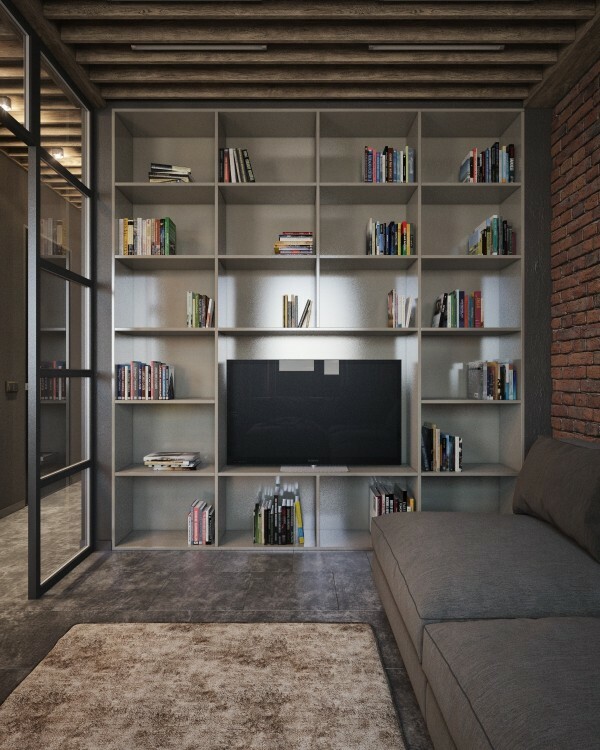 The media area, with plenty of space for a large flatscreen and open shelving for curating your favorite pieces, keeps the space from feeling cluttered with objects. Everything has a place. The large sectional feels like an ocean of soothing blue and green. 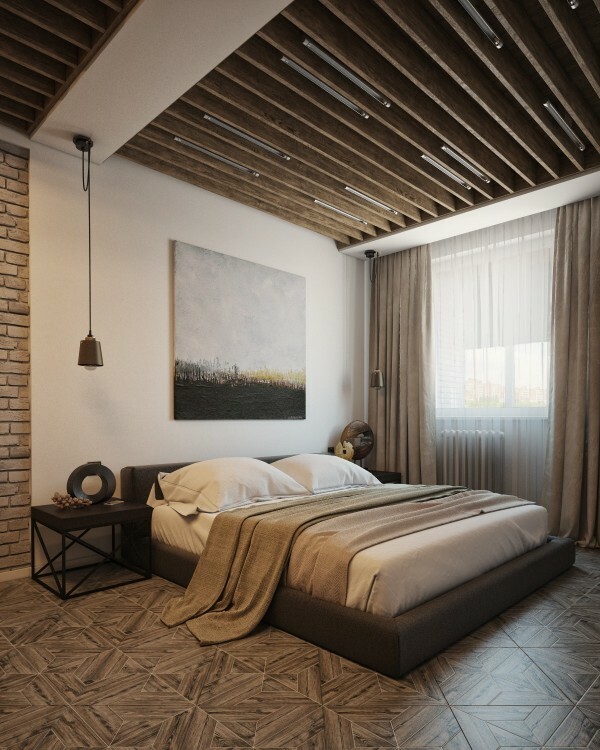 The bedroom, which blends together several textures including the exposed brick, feels so unique. 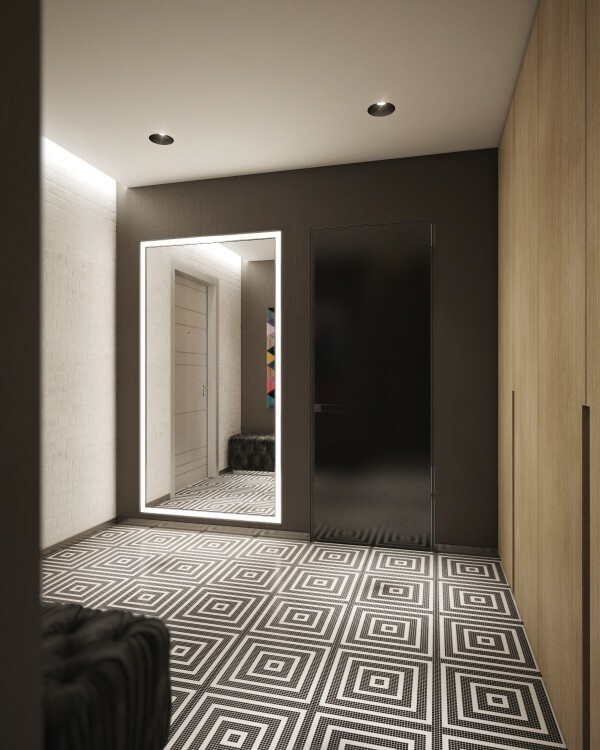 There’s contemporary design mixed with art deco geometry. Modern chevron blends expertly with midcentury hues of orange and green. A musician, indeed. 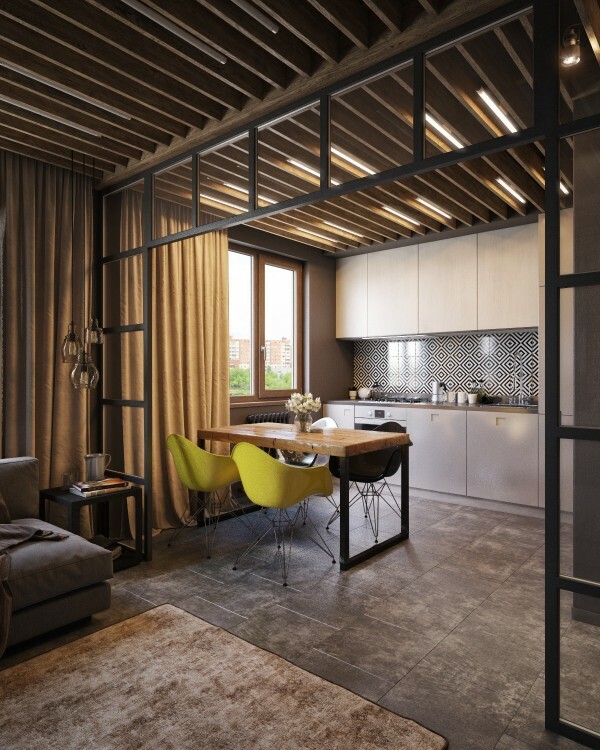 Like a song, this apartment plays its own melodies with color and texture. So much personality. 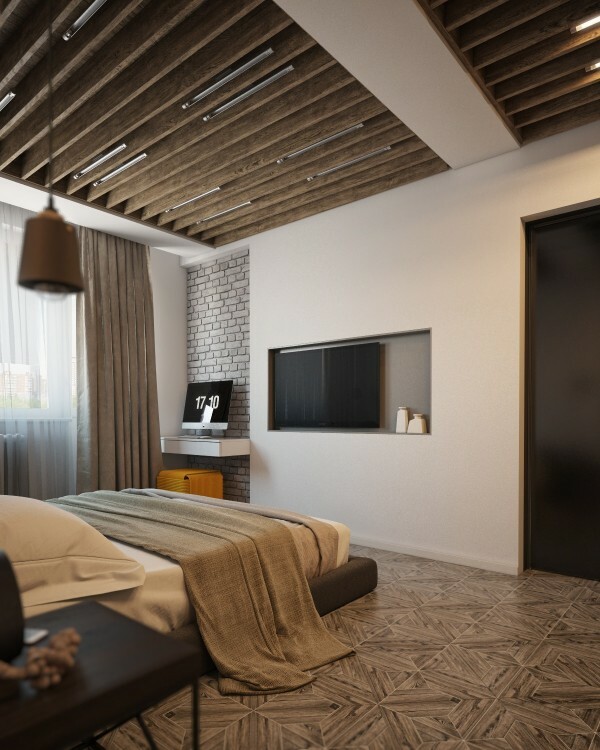 Along the bedroom wall, there’s open and closeted storage to keep the room from feeling too “busy”. 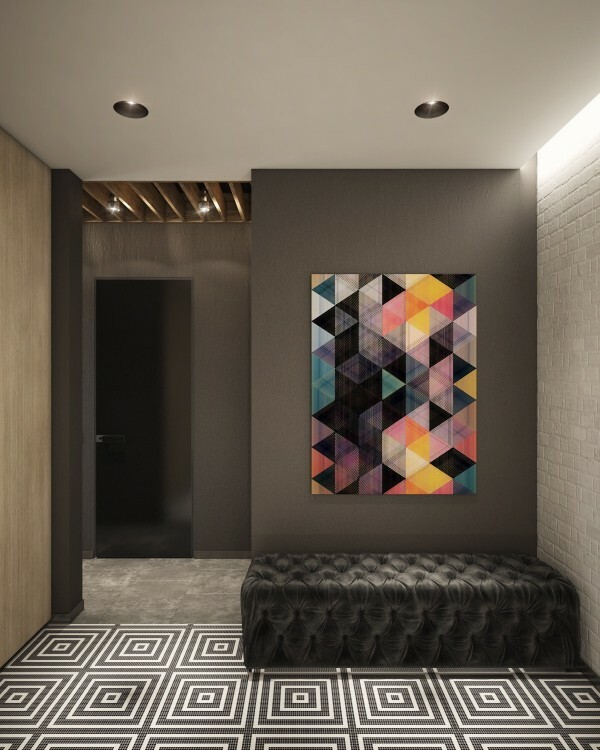 Exposed brick continues into the hallway with a striking feminine art piece taking center stage. The contrast between the sharp masculine and softened feminine is balanced so well.